When you play a primary role in your team taking five of six conference points from your main rival, your college hockey conference will reward you. 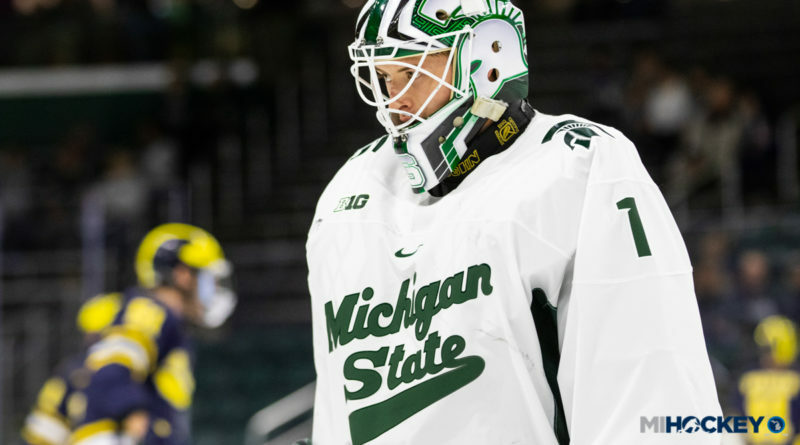 The Big Ten announced today that Michigan State goaltender Drew DeRidder has been named the conference’s second star of the week, after the freshman netminder had an impressive weekend between the pipes against Michigan. The Fenton native and USA Hockey’s National Team Development Program stopped 78 shots on the weekend, helping the Spartans to a 4-3 win on Friday and then a 1-1 tie and shootout win Saturday. He stopped four shots in OT and four more in the shootout Saturday night in front of a hostile Yost Ice Arena crowd…all after stopping 35 in regulation. Why not the top spot? DeRidder’s former NTDP teammate, K’Andre Miller, posted a four-point night in Wisconsin’s comeback win against Penn State on Saturday.